Have you discovered the beauty of a sausage skillet dinner? Chop up a few vegetables and some protein, cook them together in a skillet and presto–you have an easy, fast and fresh weeknight dinner. This fall sausage skillet dinner recipe combines the ease of a skillet supper with the intoxicating flavors of fall that make us all swoon this time of year. 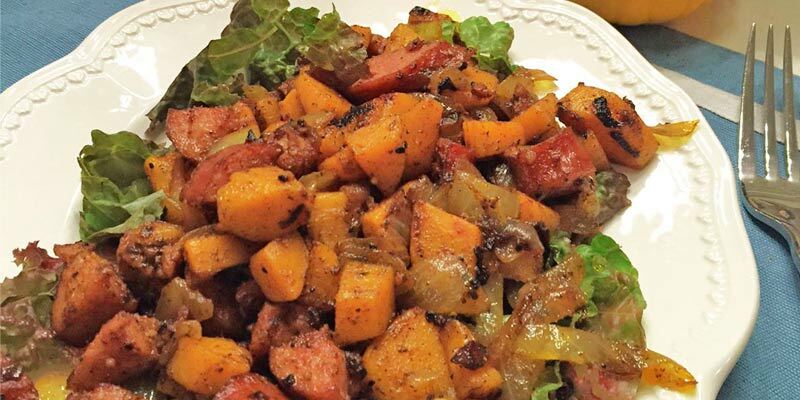 One bite of the sizzling sausage, perfectly fried sweet potatoes and onions (all seasoned with the heady aroma of cinnamon, ginger, garlic and chili powder) and this fall skillet supper will convince you that, yes, this amazing dish needs to become a staple in your family’s fall dinner menu. Now. The best part about this dish is that it comes together in minutes, and is versatile for whatever items you may have on hand. Now that’s a fall-inspired weeknight dinner recipe that performs! Add the olive oil to a large pan and saute the onions and sweet potatoes until they are almost cooked through. If you are including other vegetables in this dish such as carrots or butternut squash, add these at this time. Add the cinnamon, chili powder, garlic and ginger to the skillet and cook for a few minutes, allowing the herbs to flavor the veggies. Add the apple and the smoked sausage to the skillet. Cook for several minutes until the apple is soft and the smoked sausage is browned nicely. Serve dish immediately (by itself, or over an optional bed of lettuce or other greens).